The forth season of my favorite HTTP series is back! 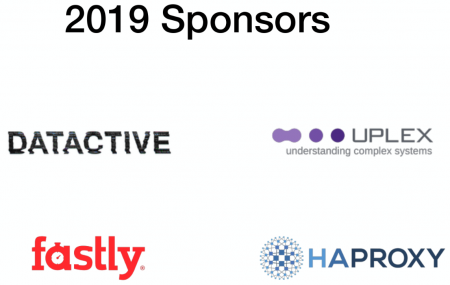 The HTTP Workshop skipped over last year but is back now with a three day event organized by the very best: Mark, Martin, Julian and Roy. 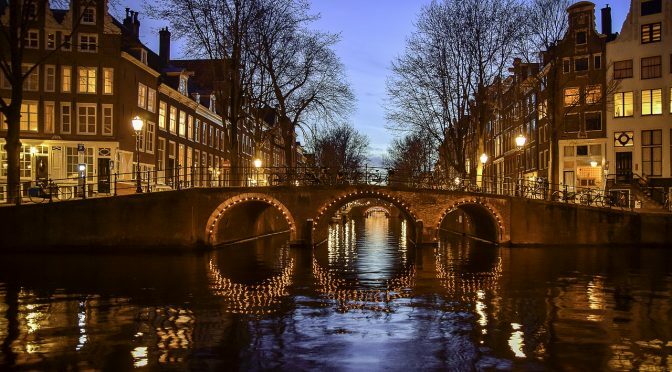 This time we’re in Amsterdam, the Netherlands. 35 persons from all over the world walked in the room and sat down around the O-shaped table setup. 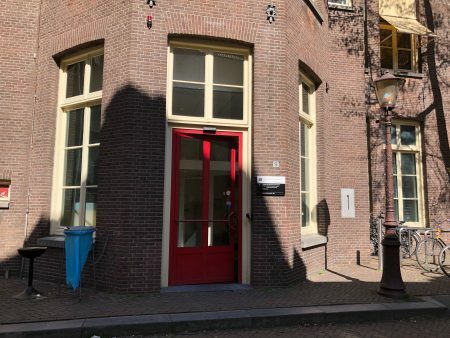 Lots of known faces and representatives from a large variety of HTTP implementations, client-side or server-side – but happily enough also a few new friends that attend their first HTTP Workshop here. The companies with the most employees present in the room include Apple, Facebook, Mozilla, Fastly, Cloudflare and Google – having three or four each in the room. Patrick Mcmanus started off the morning with his presentation on HTTP conventional wisdoms trying to identify what have turned out as successes or not in HTTP land in recent times. It triggered a few discussions on the specific points and how to judge them. I believe the general consensus ended up mostly agreeing with the slides. The topic of unshipping HTTP/0.9 support came up but is said to not be possible due to its existing use. As a bonus, Anne van Kesteren posted a new bug on Firefox to remove it. Mark Nottingham continued and did a brief presentation about the recent discussions in HTTPbis sessions during the IETF meetings in Prague last week. Martin Thomson did a presentation about HTTP authority. Basically how a client decides where and who to ask for a resource identified by a URI. This triggered an intense discussion that involved a lot of UI and UX but also trust, certificates and subjectAltNames, DNS and various secure DNS efforts, connection coalescing, DNSSEC, DANE, ORIGIN frame, alternative certificates and more. Mike West explained for the room about the concept for Signed Exchanges that Chrome now supports. A way for server A to host contents for server B and yet have the client able to verify that it is fine. Tommy Pauly then talked to his slides with the title of Website Fingerprinting. He covered different areas of a browser’s activities that are current possible to monitor and use for fingerprinting and what counter-measures that exist to work against furthering that development. By looking at the full activity, including TCP flows and IP addresses even lots of our encrypted connections still allow for pretty accurate and extensive “Page Load Fingerprinting”. We need to be aware and the discussion went on discussing what can or should be done to help out. 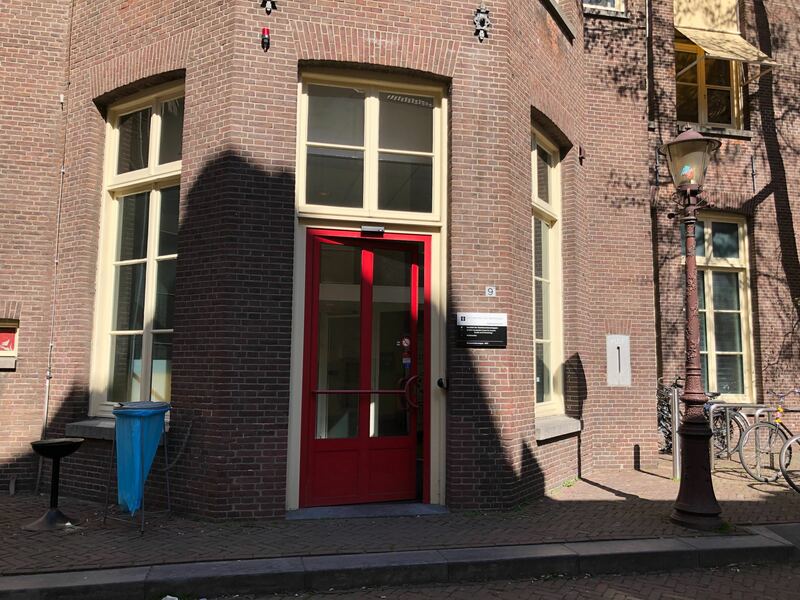 The meeting is going on somewhere behind that red door. Lucas Pardue discussed and showed how we can do TLS interception with Wireshark (since the release of version 3) of Firefox, Chrome or curl and in the end make sure that the resulting PCAP file can get the necessary key bundled in the same file. This is really convenient when you want to send that PCAP over to your protocol debugging friends. Roberto Peon presented his new idea for “Generic overlay networks”, a suggested way for clients to get resources from one out of several alternatives. A neighboring idea to Signed Exchanges, but still different. There was an interested to further and deepen this discussion and Roberto ended up saying he’d at write up a draft for it. Poul-Henning Kamp showed us vtest – a tool and framework for testing HTTP implementations that both Varnish and HAproxy are now using. Massaged the right way, this could develop into a generic HTTP test/conformance tool that could be valuable for and appreciated by even more users going forward. Asbjørn Ulsberg showed us several current frameworks that are doing GET, POST or SEARCH with request bodies and discussed how this works with caching and proposed that SEARCH should be defined as cacheable. The room mostly acknowledged the problem – that has been discussed before and that probably the time is ripe to finally do something about it. Lots of users are already doing similar things and cached POST contents is in use, just not defined generically. SEARCH is a already registered method but could get polished to work for this. It was also suggested that possibly POST could be modified to also allow for caching in an opt-in way and Mark volunteered to author a first draft elaborating how it could work. Indonesian and Tibetan food for dinner rounded off a fully packed day. Thanks Cory Benfield for sharing your notes from the day, helping me get the details straight! We’re a very homogeneous group of humans. Most of us are old white men, basically all clones and practically indistinguishable from each other. This is not diverse enough! 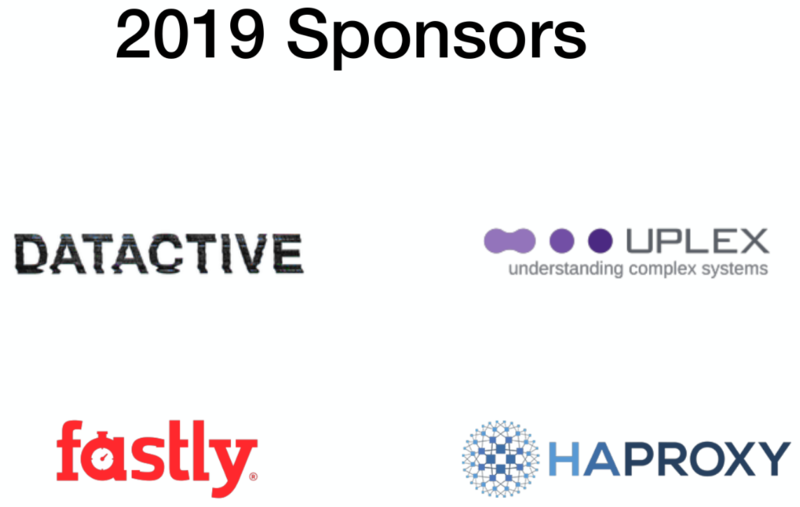 A big thank you to the HTTP Workshop 2019 sponsors! I didn’t present anything during last year’s conference, so I submitted my DNS-over-HTTPS presentation proposal early on for this year’s FOSDEM. Someone suggested it was generic enough I should rather ask for main track instead of the DNS room, and so I did. 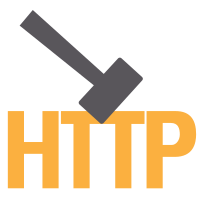 Then time passed and in November 2018 “HTTP/3” was officially coined as a real term and then, after the Mozilla devroom’s deadline had been extended for a week I filed my second proposal. I might possibly even have been an hour or two after the deadline. I hoped at least one of them would be accepted. Not only were both my proposed talks accepted, I was also approached and couldn’t decline the honor of participating in the DNS privacy panel. 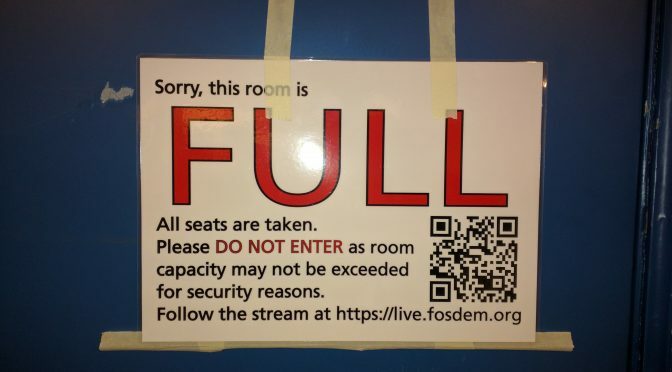 Ok, three slots in the same FOSDEM is a new record for me, but hey, surely that’s no problems for a grown-up.. I of coursed hoped there would be interest in what I had to say. I spent the time immediately before my talk with a coffee in the awesome newly opened cafeteria part to have a moment of calmness before I started. I then headed over to the U2.208 room maybe half an hour before the start time. It was packed. Quite literally there were hundreds of persons waiting in the area outside the U2 rooms and there was this totally massive line of waiting visitors queuing to get into the Mozilla room once it would open. 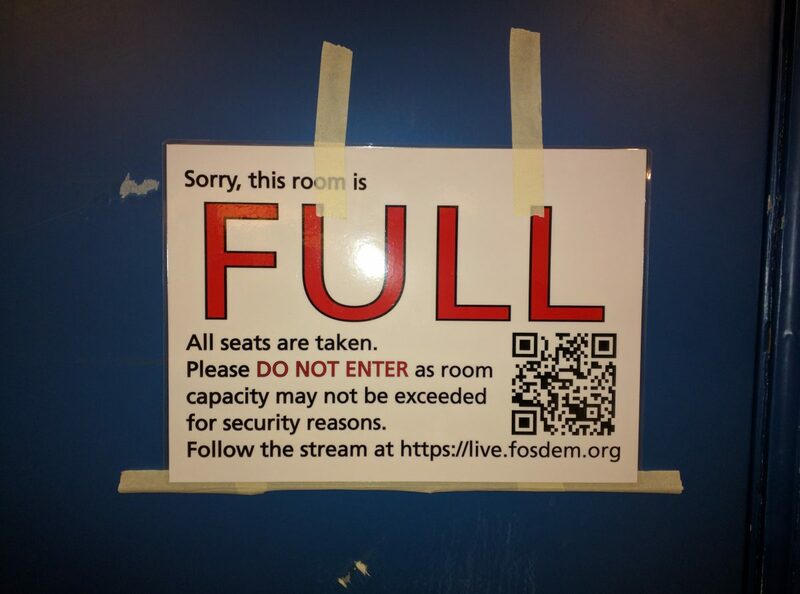 The “Sorry, this room is FULL” sign is commonly seen on FOSDEM. People don’t know who I am by my appearance so I certainly didn’t get any special treatment, waiting for my talk to start. I waited in line with the rest and when the time for my presentation started to get closer I just had to excuse myself, leave my friends behind and push through the crowd. I managed to get a “sorry, it’s full” told to me by a conference admin before one of the room organizers recognized me as the speaker of the next talk and I could walk by a very long line of humans that eventually would end up not being able to get in. The room could fit 170 souls, and every single seat was occupied when I started my presentation just a few minutes late. This presentation could have filled a much larger room. 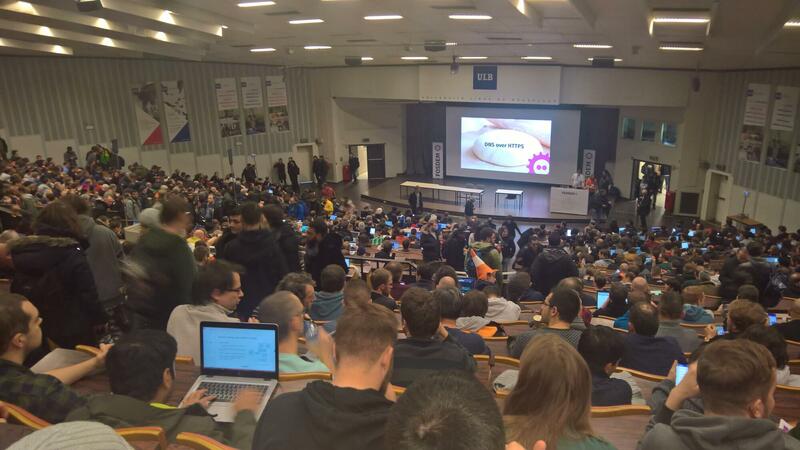 Two years ago my HTTP/2 talk filled up the 300 seat room Mozilla had that year. Video from my HTTP/3 talk. Duration 1 hour. The slides from my HTTP/3 presentation. I tend to need a little “landing time” after having done a presentation to cool off an come back to normal senses and adrenaline levels again. I got myself a lunch, a beer and chatted with friends in the cafeteria (again). During this conversation, it struck me I had forgotten something in my coming presentation and I added a slide that I felt would improve it (the screenshot showing “about:networking#dns” output with DoH enabled). In what felt like no time, it was again to move. I walked over to Janson, the giant hall that fits 1,470 persons, which I entered a few minutes ahead of my scheduled time and began setting up my machine. I started off with a little technical glitch because the projector was correctly detected and setup as a second screen on my laptop but it would detect and use a too high resolution for it, but after just a short moment of panic I lowered the resolution on that screen manually and the image appeared fine. Phew! With a slightly raised pulse, I witnessed the room fill up. Almost full. I estimate over 90% of the seats were occupied. The DNS over HTTPS talk seen from far back. Photo by Steve Holme. This was a brand new talk with all new material and I performed it for the largest audience I think I’ve ever talked in front of. Video of my DNS over HTTPS presentation. Duration 50 minutes. My DNS over HTTPS slides. I never really intended to involve myself in DNS privacy discussions, but due to the constant misunderstandings and mischaracterizations (both on purpose and by ignorance) sometimes spread about DoH, I’ve felt a need to stand up for it a few times. I think that was a contributing factor to me getting invited to be part of the DNS privacy panel that the organizers of the DNS devroom setup. There are several problems and challenges left to solve before we’re in a world with correctly and mostly secure DNS. DoH is one attempt to raise the bar. I was content to had the opportunity to really spell out my view of things before the DNS privacy panel. While sitting next to these giants from the DNS world, Stéphane Bortzmeyer, Bert Hubert and me discussed DoT, DoH, DNS centralization, user choice, quad-dns-hosters and more. The discussion didn’t get very heated but instead I think it showed that we’re all largely in agreement that we need more secure DNS and that there are obstacles in the way forward that we need to work further on to overcome. Moderator Jan-Piet Mens did an excellent job I think, handing over the word, juggling the questions and taking in questions from the audience. 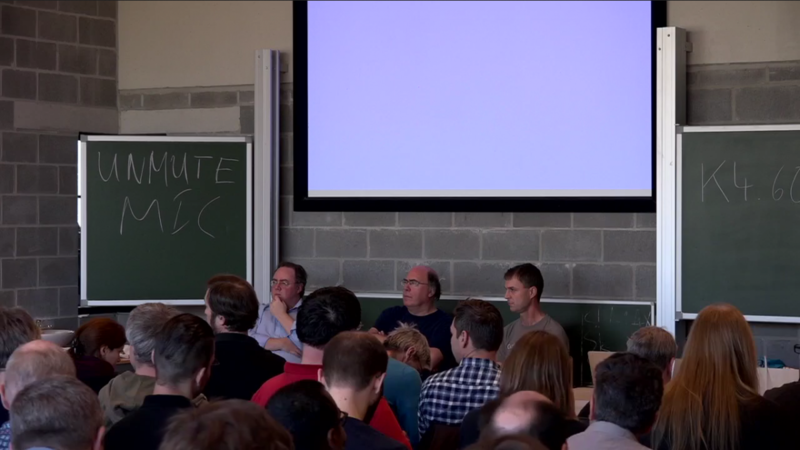 Video from the DNS Privacy panel. Duration 30 minutes. Appearing in three scheduled slots during the same FOSDEM was a bit much, and it effectively made me not attend many other talks. They were all great fun to do though, and I appreciate people giving me the chance to share my knowledge and views to the world. As usually very nicely organized and handled. The videos of each presentation are linked to above. I met many people, old and new friends. I handed out a lot of curl stickers and I enjoyed talking to people about my recently announced new job at wolfSSL. After ten consecutive annual visits to FOSDEM, I have appeared in ten program slots! The protocol we fondly know as DoH, DNS-over-HTTPS, is now officially RFC 8484 with the official title “DNS Queries over HTTPS (DoH)”. It documents the protocol that is already in production and used by several client-side implementations, including Firefox, Chrome and curl. Put simply, DoH sends a regular RFC 1035 DNS packet over HTTPS instead of over plain UDP. I’m happy to have contributed my little bits to this standard effort and I’m credited in the Acknowledgements section. I’ve also implemented DoH client-side several times now. Firefox has done studies and tests in cooperation with a CDN provider (which has sometimes made people conflate Firefox’s DoH support with those studies and that operator). These studies have shown and proven that DoH is a working way for many users to do secure name resolves at a reasonable penalty cost. At least when using a fallback to the native resolver for the tricky situations. In general DoH resolves are slower than the native ones but in the tail end, the absolutely slowest name resolves got a lot better with the DoH option. To me, DoH is partly necessary because the “DNS world” has failed to ship and deploy secure and safe name lookups to the masses and this is the one way applications “one layer up” can still secure our users. DNS-over-HTTPS (DoH) is being designed (it is not an RFC quite yet but very soon!) to allow internet clients to get increased privacy and security for their name resolves. 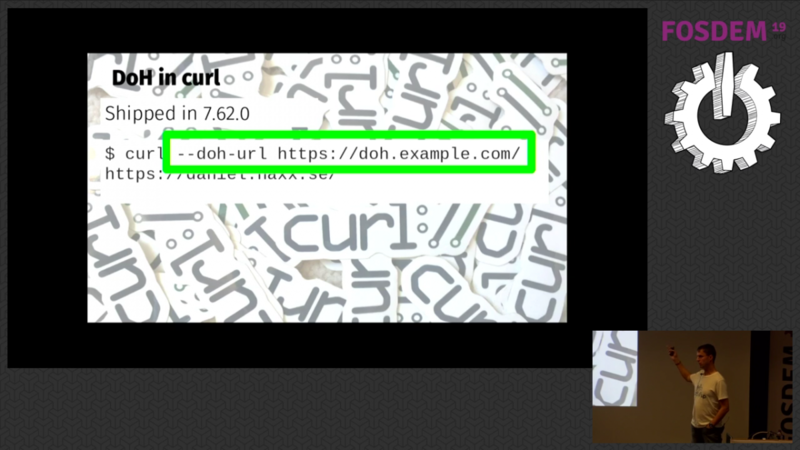 I’ve previously explained the DNS-over-HTTPS functionality within Firefox that ships in Firefox 62 and I did a presentation about DoH and its future in curl at curl up 2018. We are now introducing DoH support in curl. I hope this will not only allow users to start getting better privacy and security for their curl based internet transfers, but ideally this will also provide an additional debugging tool for DoH in other clients and servers. Let’s take a look at how we plan to let applications enable this when using libcurl and how libcurl has to work with this internally to glue things together. How do I make my libcurl transfer use DoH? There’s a primary new option added, which is the “DoH URL”. An application sets the CURLOPT_DOH_URL for a transfer, and then libcurl will use that service for resolving host names. Easy peasy. There should be nothing else in the transfer that changes or appears differently. It’ll just resolve the host names over DoH instead of using the default resolver! What about bootstrap, how does libcurl find the DoH server’s host name? Since the DoH URL itself typically is given using a host name, that first host name will be resolved using the normal resolver – or if you so desire, you can provide the IP address for that host name with the CURLOPT_RESOLVE option just like you can for any host name. If done using the resolver, the resolved address will then be kept in libcurl’s DNS cache for a short while and the DoH connection will be kept in the regular connection pool with the other connections, making subsequent DoH resolves on the same handle much faster. How do I use this from the command line? How do I make my libcurl code use this? Internally, libcurl itself creates two new easy handles that it adds to the existing multi handles and they are then performing two HTTP requests while the original transfer sits in the “waiting for name resolve” state. Once the DoH requests are completed, the original transfer’s state can progress and continue on. libcurl handles parallel transfers perfectly well already and by leveraging the already existing support for this, it was easy to add this new functionality and still work non-blocking and even event-based correctly depending on what libcurl API that is being used. We had to add a new little special thing that makes libcurl handle the end of a transfer in a new way since there are now easy handles that are created and added to the multi handle entirely without the user’s knowledge, so the code also needs to remove and delete those handles when they’re done serving their purposes. Was this hard to add to a 20 year old code base? Actually, no. It was surprisingly easy, but then I’ve also worked on a few different client-side DoH implementations already so I had gotten myself a clear view of how I wanted the functionality to work plus the fact that I’m very familiar with the libcurl internals. Plus, everything inside libcurl is already using non-blocking code and the multi interface paradigms so the foundation for adding parallel transfers like this was already in place. The entire DoH patch for curl, including documentation and test cases, was a mere 1500 lines. This is merged into the master branch in git and is planned to ship as part of the next release: 7.62.0 at the end of October 2018. Firefox supports DNS-over-HTTPS (aka DoH) since version 62. In trr-only mode, nobody on your local network nor on your ISP can snoop on your name resolves. The SNI part of HTTPS connections are still clear text though, so eavesdroppers on path can still figure out which hosts you connect to. A primary problem for trr-only is that we usually want to use a host name in the URI for the DoH server (we typically need it to be a name so that we can verify the server’s certificate against it), but we can’t resolve that host name until DoH is setup to work. A catch-22. Tell Firefox the IP address of the name that you use in the URI. We call it the “bootstrapAddress”. See further below. Use a DoH server that is provided on an IP-number URI. This is rather unusual. There’s for example one at 1.1.1.1.
network.trr.mode – set this to the number 3.
network.trr.uri – set this to the URI of the DoH server you want to use. This should be a server you trust and want to hand over your name resolves to. The Cloudflare one we’ve previously used in DoH tests with Firefox is https://mozilla.cloudflare-dns.com/dns-query. network.trr.bootstrapAddress– when you use a host name in the URI for the network.trr.uri pref you must set this pref to an IP address that host name resolves to for you. It is important that you pick an IP address that the name you use actually would resolve to. Let’s pretend you want to go full trr-only and use a DoH server at https://example.com/dns. (it’s a pretend URI, it doesn’t work). dig might give you a whole list of addresses back, and then you can pick any one of them in the list. Only pick one address though. Go to “about:config” and paste the copied IP address into the value field for network.trr.bootstrapAddress. Now TRR / DoH should be able to get going. When you can see web pages, you know it works! If you happen to start Firefox behind a captive portal while in trr-only mode, the connections to the DoH server will fail and no name resolves can be performed. In those situations, normally Firefox’s captive portable detector would trigger and show you the login page etc, but when no names can be resolved and the captive portal can’t respond with a fake response to the name lookup and redirect you to the login, it won’t get anywhere. It gets stuck. And currently, there’s no good visual indication anywhere that this is what happens. You simply can’t get out of a captive portal with trr-only. You probably then temporarily switch mode, login to the portal and switch the mode to 3 again. If you “unlock” the captive portal with another browser/system, Firefox’s regular retries while in trr-only will soon detect that and things should start working again. DNS over HTTPS (DOH) is a feature where a client shortcuts the standard native resolver and instead asks a dedicated DOH server to resolve names. Compared to regular unprotected DNS lookups done over UDP or TCP, DOH increases privacy, security and sometimes even performance. It also makes it easy to use a name server of your choice for a particular application instead of the one configured globally (often by someone else) for your entire system. DNS over HTTPS is quite simply the same regular DNS packets (RFC 1035 style) normally sent in clear-text over UDP or TCP but instead sent with HTTPS requests. Your typical DNS server provider (like your ISP) might not support this yet. To get the finer details of this concept, check out Lin Clark’s awesome cartoon explanation of DNS and DOH. This new Firefox feature is planned to get ready and ship in Firefox release 62 (early September 2018). You can test it already now in Firefox Nightly by setting preferences manually as described below. This article will explain some of the tweaks, inner details and the finer workings of the Firefox TRR implementation (TRR == Trusted Recursive Resolver) that speaks DOH. All preferences (go to “about:config”) for this functionality are located under the “network.trr” prefix. network.trr.mode – set which resolver mode you want. 1 – Race native against TRR. Do them both in parallel and go with the one that returns a result first. 2 – TRR first. Use TRR first, and only if the name resolve fails use the native resolver as a fallback. 3 – TRR only. Only use TRR. Never use the native (after the initial setup). 4 – Shadow mode. Runs the TRR resolves in parallel with the native for timing and measurements but uses only the native resolver results. 5 – Explicitly off. Also off, but selected off by choice and not default. network.trr.uri – (default: none) set the URI for your DOH server. That’s the URL Firefox will issue its HTTP request to. It must be a HTTPS URL (non-HTTPS URIs will simply be ignored). If “useGET” is enabled, Firefox will append “?ct&dns=….” to the URI when it makes its HTTP requests. For the default POST requests, they will be issued to exactly the specified URI. “mode” and “uri” are the only two prefs required to set to activate TRR. The rest of them listed below are for tweaking behavior. We list some publicly known DOH servers here. If you prefer to, it is easy to setup and run your own. network.trr.credentials – (default: none) set credentials that will be used in the HTTP requests to the DOH end-point. It is the right side content, the value, sent in the Authorization: request header. Handy if you for example want to run your own public server and yet limit who can use it. network.trr.wait-for-portal – (default: true) this boolean tells Firefox to first wait for the captive portal detection to signal “okay” before TRR is used. network.trr.allow-rfc1918 – (default: false) set this to true to allow RFC 1918 private addresses in TRR responses. When set false, any such response will be considered a wrong response that won’t be used. network.trr.useGET – (default: false) When the browser issues a request to the DOH server to resolve host names, it can do that using POST or GET. By default Firefox will use POST, but by toggling this you can enforce GET to be used instead. The DOH spec says a server MUST support both methods. network.trr.confirmationNS – (default: example.com) At startup, Firefox will first check an NS entry to verify that TRR works, before it gets enabled for real and used for name resolves. This preference sets which domain to check. The verification only checks for a positive answer, it doesn’t actually care what the response data says. network.trr.bootstrapAddress – (default: none) by setting this field to the IP address of the host name used in “network.trr.uri”, you can bypass using the system native resolver for it. This avoids that initial (native) name resolve for the host name mentioned in the network.trr.uri pref. network.trr.request-timeout – (default: 3000) is the number of milliseconds a request to and corresponding response from the DOH server is allowed to spend until considered failed and discarded. network.trr.early-AAAA – (default: false) For each normal name resolve, Firefox issues one HTTP request for A entries and another for AAAA entries. The responses come back separately and can come in any order. If the A records arrive first, Firefox will – as an optimization – continue and use those addresses without waiting for the second response. If the AAAA records arrive first, Firefox will only continue and use them immediately if this option is set to true. network.trr.max-fails – (default: 5) If this many DoH requests in a row fails, consider TRR broken and go back to verify-NS state. This is meant to detect situations when the DoH server dies. network.trr.disable-ECS – (default: true) If set, TRR asks the resolver to disable ECS (EDNS Client Subnet – the method where the resolver passes on the subnet of the client asking the question). Some resolvers will use ECS to the upstream if this request is not passed on to them. With regular DNS, it is common to have clients in different places get different results back. This can be done since the servers know from where the request comes (which also enables quite a degree of spying) and they can then respond accordingly. When switching to another resolver with TRR, you may experience that you don’t always get the same set of addresses back. At times, this causes problems. As a precaution, Firefox features a system that detects if a name can’t be resolved at all with TRR and can then fall back and try again with just the native resolver (the so called TRR-first mode). Ending up in this scenario is of course slower and leaks the name over clear-text UDP but this safety mechanism exists to avoid users risking ending up in a black hole where certain sites can’t be accessed. Names that causes such TRR failures are then put in an internal dynamic blacklist so that subsequent uses of that name automatically avoids using DNS-over-HTTPS for a while (see the blacklist-duration pref to control that period). Of course this fall-back is not in use if TRR-only mode is selected. In addition, if a host’s address is retrieved via TRR and Firefox subsequently fails to connect to that host, it will redo the resolve without DOH and retry the connect again just to make sure that it wasn’t a split-horizon situation that caused the problem. When a host name is added to the TRR blacklist, its domain also gets checked in the background to see if that whole domain perhaps should be blacklisted to ensure a smoother ride going forward. With the implementation of DNS-over-HTTPS, Firefox now gets the TTL (Time To Live, how long a record is valid) value for each DNS address record and can store and use that for expiry time in its internal DNS cache. Having accurate lifetimes improves the cache as it then knows exactly how long the name is meant to work and means less guessing and heuristics. When using the native name resolver functions, this time-to-live data is normally not provided and Firefox does in fact not use the TTL on other platforms than Windows and on Windows it has to perform some rather awkward quirks to get the TTL from DNS for each record. Still left to see how useful this will become in real-life, but DOH servers can push new or updated DNS records to Firefox. HTTP/2 Server Push being responses to requests the client didn’t send but the server thinks the client might appreciate anyway as if it sent requests for those resources. These pushed DNS records will be treated as regular name resolve responses and feed the Firefox in-memory DNS cache, making subsequent resolves of those names to happen instantly. You specify the DOH service as a full URI with a name that needs to be resolved, and in a cold start Firefox won’t know the IP address of that name and thus needs to resolve it first (or use the provided address you can set with network.trr.bootstrapAddress). Firefox will then use the native resolver for that, until TRR has proven itself to work by resolving the network.trr.confirmationNS test domain. Firefox will also by default wait for the captive portal check to signal “OK” before it uses TRR, unless you tell it otherwise. As a result of this bootstrap procedure, and if you’re not in TRR-only mode, you might still get a few native name resolves done at initial Firefox startups. Just telling you this so you don’t panic if you see a few show up. The code is aware of CNAME records and will “chase” them down and use the final A/AAAA entry with its TTL as if there were no CNAMEs present and store that in the in-memory DNS cache. This initial approach, at least, does not cache the intermediate CNAMEs nor does it care about the CNAME TTL values. Firefox currently allows no more than 64(!) levels of CNAME redirections. Enter that address in the Firefox URL bar to reach the debug screen with a bunch of networking information. If you then click the DNS entry in the left menu, you’ll get to see the contents of Firefox’s in-memory DNS cache. The TRR column says true or false for each name if that was resolved using TRR or not. If it wasn’t, the native resolver was used instead for that name. When in private browsing mode, DOH behaves similar to regular name resolves: it keeps DNS cache entries separately from the regular ones and the TRR blacklist is then only kept in memory and not persisted to disk. The DNS cache is flushed when the last PB session is exited. I wrote up dns2doh, a little tool to create DOH requests and responses with, that can be used to build your own toy server with and to generate requests to send with curl or similar. I also wrote doh, which is a small stand-alone tool (based on libcurl) that issues requests for the A and AAAA records of a given host name from the given DOH URI. Browsers often already have a lot of existing HTTPS connections to the same CDNs that might offer DOH. Further explained in Patrick Mcmanus’ The Benefits of HTTPS for DNS. It still leaks the SNI! Yes, the Server Name Indication field in the TLS handshake is still clear-text, but we hope to address that as well in the future with efforts like encrypted SNI. If you want to enable HTTP logging and see what TRR is doing, set the environment variable MOZ_LOG component and level to “nsHostResolver:5”. The TRR implementation source code in Firefox lives in netwerk/dns. While I have written most of the Firefox TRR implementation, I’ve been greatly assisted by Patrick Mcmanus. Valentin Gosu, Nick Hurley and others in the Firefox Necko team. Since I am also the lead developer of curl people have asked. The work on DOH for curl has not really started yet, but I’ve collected some thoughts on how DNS-over-HTTPS could be implemented in curl and the doh tool I mentioned above has the basic function blocks already written. There have been other DNS-over-HTTPS protocols and efforts. Recently there was one offered by at least Google that was a JSON style API. That’s different. There’s also DNS-over-TLS which shares some of the DOH characteristics, but lacks for example the nice ability to work through proxies, do multiplexing and share existing connections with standard web traffic. DNScrypt is an older effort that encrypts regular DNS packets and sends them over UDP or TCP. Sometimes you want to issue a curl command against a server, but you don’t really want curl to resolve the host name in the given URL and use that, you want to tell it to go elsewhere. To the “wrong” host, which in this case of course happens to be the right host. Because you know better. The classic and and easy to understand way to send a request to the wrong HTTP host is to simply send a different Host: header so that the server will provide a response for that given server. curl will also make cookies work for example.com in this case, but it will fail miserably if the page redirects to another host and you enable redirect-following (–location) since curl will send the fake Host: header in all further requests too. The –header option cleverly cancels the built-in provided Host: header when a custom one is provided so only the one passed in from the user gets sent in the request. We’re using HTTPS everywhere these days and just faking the Host: header is not enough then. An HTTPS server also needs to get the server name provided already in the TLS handshake so that it knows which cert etc to use. The name is provided in the SNI field. curl also needs to know the correct host name to verify the server certificate against (server certificates are rarely registered for an IP address). curl extracts the name to use in both those case from the provided URL. Under the hood this option populates curl’s DNS cache with a custom entry for “example.com” port 443 with the address 127.0.0.1, so when curl wants to connect to this host name, it finds your crafted address and connects to that instead of the IP address a “real” name resolve would otherwise return. This method also works perfectly when following redirects since any further use of the same host name will still resolve to the same IP address and redirecting to another host name will then resolve properly. You can even use this option multiple times on the command line to add custom addresses for several names. You can also add multiple IP addresses for each name if you want to. As shown above, –resolve is awesome if you want to point curl to a specific known IP address. But sometimes that’s not exactly what you want either. Imagine you have a host name that resolves to a number of different host names, possibly a number of front end servers for the same site/service. Not completely unheard of. Now imagine you want to issue your curl command to one specific server out of the front end servers. It’s a server that serves “example.com” but the individual server is called “host-47.example.com”. You could resolve the host name in a first step before curl is used and use –resolve as shown above. Or you can use –connect-to, which instead works on a host name basis. Using this, you can make curl replace a specific host name + port number pair with another host name + port number pair before the name is resolved! Most options in curl are individually controlled which means that there’s rarely logic that prevents you from using them in the awesome combinations that you can think of. — resolve, — connect-to and — header can all be used in the same command line! curl --resolve example.com:443:127.0.0.1 https://example.com/ --header "Host: diff.example.com"
All the above with libcurl? When you’re done playing with the curl options as described above and want to convert your command lines to libcurl code instead, your best friend is called –libcurl. Just append –libcurl example.c to your command line, and curl will generate the C code template for you in that given file name. Based on that template, making use of that code correctly is usually straight-forward and you’ll get all the options to read up in a convenient way. Update: thanks to @Manawyrm, I fixed the ndash issues this post originally had. I’ve worked in open source projects for some 20 years and I’ve maintained curl and libcurl for over 15 years. I’m an internet protocol geek at heart and Mozilla seems like a perfect place for me to continue to explore this interest of mine and combine it with real open source in its purest form. I plan to use my experiences from all my years of protocol fiddling and making stuff work on different platforms against random server implementations into the networking team at Mozilla and work on improving Firefox and more. I’m putting my current embedded Linux focus to the side and I plunge into a worldwide known company with worldwide known brands to do open source within the internet protocols I enjoy so much. I’ll be working out of my home, just outside Stockholm Sweden. Mozilla has no office in my country and I have no immediate plans of moving anywhere (with a family, kids and all established here). I intend to bring my mindset on protocols and how to do things well into the Mozilla networking stack and world and I hope and expect that I will get inspiration and input from Mozilla and take that back and further improve curl over time. My agreement with Mozilla also gives me a perfect opportunity to increase my commitment to curl and curl development. I want to maintain and possibly increase my involvement in IETF and the httpbis work with http2 and related stuff. With one foot in Firefox and one in curl going forward, I think I may have a somewhat unique position and attitude toward especially HTTP. I’ve not yet met another Swedish Mozillian but I know I’m not the only one located in Sweden. I guess I now have a reason to look them up and say hello when suitable. Björn and Linus will continue to drive and run Haxx with me taking a step back into the shadows (Haxx-wise). I’ll still be part of the collective Haxx just as I was for many years before I started working full-time for Haxx in 2009. My email address, my sites etc will remain on haxx.se. I’m looking forward to 2014! Notice: this is not an advanced nor secret trickery. This is just something I’ve found even techsavvy people in my surrounding not having done so its worth being highlighted. When I upgraded to fiber from ADSL,Â I had to give up my fixed IPv4 address that I’ve been using for around 10 years and switch to a dynamic DNS service . In this situation I see lots of people everywhere use dyndns.org and similar services that offer dynamicly assigning a new IP to a fixed host name so that you and your computerÂ illiterateÂ friends still can reach your home site. I suggest a minor variation of this, that still avoids having to run your own dyndns server on your server. It only requires that you admin and control a DNS domain already, but who doesn’t these days? 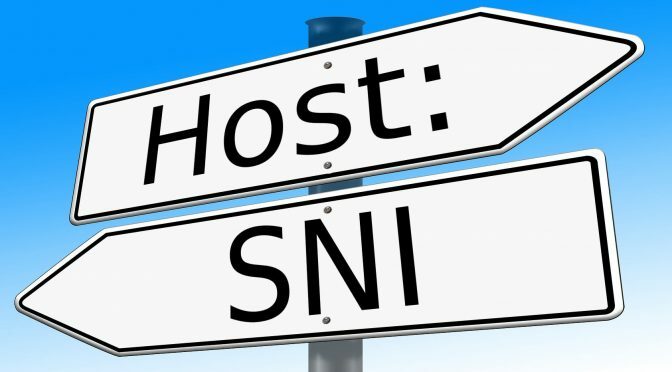 Get that dyndns host name at the free provider that makes the name hold your current IP. Let’s call it home.dyndns.org. Now you can ping or ssh or whatever to ‘home.example.com‘ and it will remain your home IP even when it moves. For example, if you’re a small open source project it makes a perfect way to feature a distributed service that appears with a single name but is hosted by multiple distributed independent servers across the Internet. It is also used by high profile web servers, like for example www.google.com and www.yahoo.com. If you’re an old-school hacker, if you learned to do socket and TCP/IP programming from the original Stevens’ books and if you were brought up on BSD unix you learned that you resolve host names with gethostbyname() and friends. This is a POSIX and single unix specification that’s been around since basically forever. When calling gethostbyname() on a given round robin host name, the function returns an array of addresses. That list of addresses will be in a seemingly random order. If an application just iterates over the list and connects to them in the order as received, the round robin concept works perfectly well. gethostbyname() is really IPv4-focused. The mere whisper of IPv6 makes it break down and cry. It had to be replaced by something better. Enter getaddrinfo() also POSIX (and defined in RFC 3943 and again updated in RFC 5014). This is the modern function that supports IPv6 and more. It is the shiny thing the world needed! So the (good parts of the) world replaced all calls to gethostbyname() with calls to getaddrinfo() and everything now supported IPv6 and things were all dandy and fine? Not exactly. Because there were subtleties involved. Like in which order these functions return addresses. In 2003 the IETF guys had shipped RFC 3484 detailing Default Address Selection for Internet Protocol version 6, and using that as guideline most (all?) implementations were now changed to return the list of addresses in that order. It would then become a list of hosts in “preferred” order. 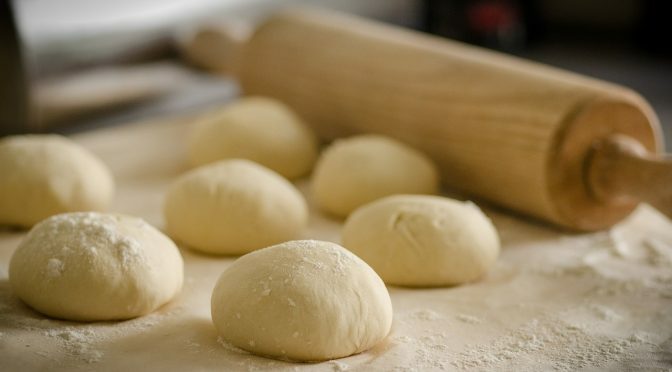 Suddenly applications would iterate over both IPv4 and IPv6 addresses and do it in an order that would be clever from an IPv6 upgrade-path perspective. So, back to the good old way to do round robin DNS: multiple addresses (be it IPv4 or IPv6 or both). With the new ideas of how to return addresses this load balancing way no longer works. Now getaddrinfo() returns basically the same order in every invoke. I noticed this back in 2005 and posted a question on the glibc hackers mailinglist: http://www.cygwin.com/ml/libc-alpha/2005-11/msg00028.html As you can see, my question was delightfully ignored and nobody ever responded. The order seems to be dictated mostly by the above mentioned RFCs and the local /etc/gai.conf file, but neither is helpful if getting decent round robin is your aim. Others have noticed this flaw as well and some have fought compassionately arguing that this is a bad thing, while of course there’s an opposite side with people claiming it is the right behavior and that doing round robin DNS like this was a bad idea to start with anyway. The impact on a large amount of common utilities is simply that when they go IPv6-enabled, they also at the same time go round-robin-DNS disabled. Since getaddrinfo() now has worked like this for almost a decade, we can forget about “fixing” it. Since gai.conf needs local edits to provide a different function response it is not an answer. But perhaps worse is, since getaddrinfo() is now made to return the addresses in a sort of order of preference it is hard to “glue on” a layer on top that simple shuffles the returned results. Such a shuffle would need to take IP versions and more into account. And it would become application-specific and thus would have to be applied to one program at a time. The popular browsers seem less affected by this getaddrinfo drawback. My guess is that because they’ve already worked on making asynchronous name resolves so that name resolving doesn’t lock up their processes, they have taken different approaches and thus have their own code for this. In curl’s case, it can be built with c-ares as a resolver backend even when supporting IPv6, and c-ares does not offer the sort feature of getaddrinfo and thus in these cases curl will work with round robin DNSes much more like it did when it used gethostbyname. The downside with all alternatives I’m aware of is that they aren’t just taking advantage of plain DNS. In order to duck for the problems I’ve mentioned, you can instead tweak your DNS server to respond differently to different users. That way you can either just randomly respond different addresses in a round robin fashion, or you can try to make it more clever by things such as PowerDNS’s geobackend feature. Of course we all know that A) geoip is crude and often wrong and B) your real-world geography does not match your network topology. During this period, another connection related issue has surfaced. The fact that IPv6 connections are often handled as a second option in dual-stacked machines, and the fact is that IPv6 is mostly present in dual stacks these days. This sadly punishes early adopters of IPv6 (yes, they unfortunately IPv6 must still be considered early) since those services will then be slower than the older IPv4-only ones. There seems to be a general consensus on what the way to overcome this problem is: the Happy Eyeballs approach. In short (and simplified) it recommends that we try both (or all) options at once, and the fastest to respond wins and gets to be used. 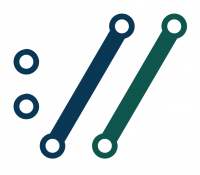 This requires that we resolve A and AAAA names at once, and if we get responses to both, we connect() to both the IPv4 and IPv6 addresses and see which one is the fastest to connect. My point being that introducing Happy Eyeballs in your good old socket app will require some rather major remodeling no matter what. Doing this will most likely also affect how your application handles with round robin DNS so now you have a chance to reconsider your choices and code!